It's time to get serious about Dwarfs. Not a single tankard of grog is chugged in the latest Total War: Warhammer trailer, which shows their brutal ongoing struggle with Orc and Goblin hordes. For the first time in Total War history these fights can spread to strongholds deep beneath the earth. "Players will also be able to experience underground battlefields for the first time in Total War, with all the horrors of the dark and wonders of the deep they contain…" says today's press release. 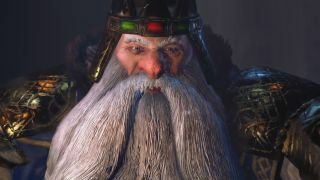 The star of the trailer is High King Thorgrim Grudgebearer. He spends his days writing a list of every person who has wronged him in a giant tome in blood. If you're interested the list goes:1. orcs, 2. orcs, 3. orcs and so on for four hundred pages. If you're wondering why he calls them "URKS" then that's probably a concession to the rebranding of Warhammer Fantasy's races, made by the Age of Sigmar update to the tabletop game. Orcs are now "Orruks"; Elves are now "Aelfs"; Ogres are "Ogors". It's very silly. The new trailer is rendered in-engine and uses in-game animations, presumably for the charging and fighting parts. A few new units are revealed, including Gyrocopters and Night Goblins. For more Total War: Warhammer, check out our in-depth preview feature, and this ten minute video of a huge scrap between Orks and Empire. Three of the four playable factions have been shown. Vampire Counts are the last, and we've yet to see how exactly Chaos will work.